THE VIEWS DON'T GET ANY BETTER THAN THIS! True Oceanfront with a panoramic view of the Pacific Ocean, the island of Lana'i, the West Maui Mountains and Maalea Harbor. Spectacular sunsets and swaying palm trees. Great Whale watching (December through April). PREMIUM CONDO Our home is beautifully and tastefully furnished with great amenities including free high speed Wireless Internet. Condo is fully tiled. Our living room has a queen sleeper sofa, love seat, and chair. Large LCD HDTV (cable), with DVD, stereo. Oceanfront Living Room wall is all glass with doubly-opening slider. Master Bedroom with King bed, wall-mounted LCD HDTV, and handy plugs for recharging your phones and other electronics. KITCHEN granite slab counters with all the appliances and utensils you could need. WASHER & DRYER in our unit. FULLY AIR CONDITIONED and ceiling fans in all rooms. LANAI 22-foot long, private Lanai provides relaxation in Maui's soothing trade winds with the incredible ocean view. Two ceiling fans create breezes on windless days. TENNIS-PICKLEBALL COURTS on the ocean! TOY CLOSET towels, mats, chairs, boogie boards, snorkeling gear, sand buckets, cooler, tennis equipment, etc. (You can leave your toys at home!). Manicured grounds, Large Pool, Hot Tub, Small Exercise Room with Dry Sauna, Putting green. There are better equipped gyms nearby, contact us if you need additional information. While our beach is not the best for swimming, it is an uncrowded beach to enjoy walks on. It is protected by an off-shore reef making for only small waves. It gets deep very, very slowly. Both of these are great qualities for small children. The smooth morning waters are perfect for stand-up paddleboarding (available for rent by the pool). There is great windsurfing and kitesurfing to participate in or observe. 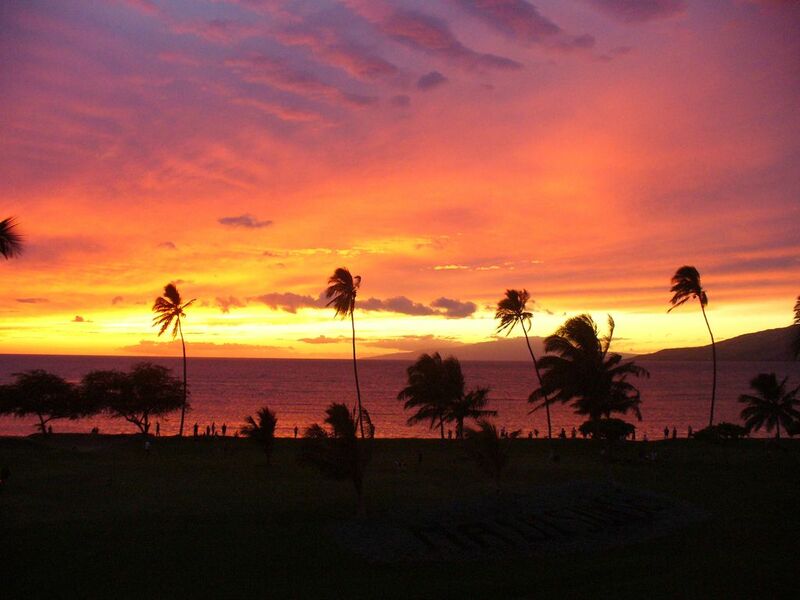 Our panoramic lanai view is incredible and you will find no better views on Maui. If you are looking for something truly special ... contact us. If you know the Maui Sunset you'll want to know our location: Our condo is in the B building, Number 421. The first number (4) indicates the floor, and the remainder (21) denotes the 21st unit. Each floor has 23 units with Number 1 being the farthest from the ocean and Number 23 the very closest to the ocean. There is not a finer condo to rent at the Maui Sunset in terms of furnishings and our view. Kihei's warm, sunny weather is the best on Maui. Our home is conveniently located within easy driving time of the airport, Lahaina, and Wailea. Walk to nearby grocery store, gift shops, craft market, drug store, Post Office, restaurants, fast food and gift shops. Excellent golf courses are nearby. Activity Desk on the property can assist with coordinating special trips and activities. Paul and Joan currently reside in Texas and Minnesota. Prior to that they lived in West Virginia and Albuquerque, New Mexico. Paul was lucky to have spent two years on Oahu as a child. A medical meeting on Maui rekindled the passion for Hawaii. They love to visit the different beaches, snorkeling, kitesurfing (Paul), and relaxing on the lanai - especially the mornings and sunsets. After exploring all the condos in Kihei we chose the Maui Sunset for it's ambience, impeccable grounds and pool. Everyone was so friendly. When we first walked into the condo we ultimately purchased we were left breathless by the view, and knew it was the right one. Our beach is never crowded and perfect for daily walks. The central location of our condo makes it easy for us to explore the rest of Maui. We keep our condo equipped the way we like to enjoy it. We've taken care in updating our condo with modern features. Our guests appreciate these touches and all the amenities we leave for them to enjoy. Joan loves to cook, and we always have dinner parties with friends when we visit. Most days we take small half-day trips to enjoy all that Maui has to offer. By late afternoon we love to soak in the pool and hot tub, read, and talk with our friends (old and new). We cook most of meals in the condo or outside on the BBQs. Morning coffee out on the lanai while watching the West Maui mountains light up with the rising sun never gets old with us. Master bath has separate vanity space, bath with toilet and walk-in shower. Guest bath has vanity, toilet and walk-in shower. Free phone service to states and Canada. Up to 20 MB/sec speeds. Bath towels and beach towels provided for guests. Exercise room on site, with dry sauna. Two elevators in building. My unit is close to elevator - 50 feet. Bosch, quite quiet, can run anytime day or night. Drip coffee maker. Have paper filters and starter coffee pack for guests. Granite countertops Outfitted with almost all needed appliances - large and small. Coffeemaker, toaster, blenders (ninja), rice cooker, crockpot, BBQ tools. 2 extra chairs stored in guest room closet, to sit up to 6. But honestly most guests are like us and eat almost all meals out on the lanai (balcony), which easily sits 6. Cable TV, many HD channels. Many paperbacks, both in our unit, and at the Activity Desk. Some Hawaiian artists' CDs to set the mood. Large number of movies, good selection. Lawn is like a golf green, pure heaven for bare feet. Largest of any 2 BDR condo at the Maui Sunset. Active Hawaiian Canoe clubs welcome guests. Less than 2 miles from condo. Special way to experience Hawaii. Paddleboard gear can be rented at our activities desk. We have snorkeling gear, boogie boards, beach towels/umbrellas/chairs, tennis racquets and balls in our unit for the use of our guests. Courts immediately in front on our condo. Active group of Pickle Ball players too. Ceiling Fans, Binoculars, Coffee Maker, Blender, Rice Maker, Ironing Board & Iron, Washer & Dryer in Unit, Toy closet with Beach chairs, cooler,snorkeling gear, tennis rackets, boogie boards, beach towels, etc. Exercise Room (Shared). The condo was extremely well equipped with sports and cooking equipment. Great location to travel short distances to outstanding beaches. Unit itself was extremely well maintained. And, yes the ocean view was magnificent. Clean, comfortable, spectular views. Highly recommend. We have had a lovely stay at your condo. It was very clean and confortable. We were able to utilize the beach towels, cooler, beach chairs, and even try out the snorkel masks! The view from the Lani was perfect morning coffee, afternoon sunsets & all of the activity on the grounds. We even saw whales spouting & breaching from the Lani during dinner. All of the kitchen amenities were wonderful and filled the 4 coffee tumblers with cold water to take with us on our car adventures. We would highly recommend your condo and hope to come back another year. Very nice, well maintained unit. Centrally located to all of the attractions in Maui but best of all are the sunset views and ability to whale watch. Great and comfortable unit. We had a lovely stay. We enjoyed our stay very much. The condo is comfortable, well equipped, and has a lovely view. This is an absolutely beautiful unit with a stunning view! The property was extremely well-appointed and maintained. There wouldn't be anything more you could ask for in a vacation rental. From the beautiful furnishings, to the amazing full sliding doors and outstanding remodel of the kitchen affording a gorgeous view from the kitchen counters and sink. The owners have thought of everything, have it very well organized and are extremely responsive and thoughtful. They even contacted us prior to arrival to see if we would want them to leave some Christmas décor in the unit! The rating for the owners Paul and Joan and their unit would be nothing short of an A+ I would definitely return to their beautiful home away from home! The condo had beautiful views of the ocean and beautiful views of the mountains. The sunsets from the Lanai were gorgeous. The condo was loaded with fun stuff for the family including snorkel equipment fins, beach shoes, boogie boards, games, and books, and satellite television. The kitchen was also well equipped including spices, oils, and lots of extra kitchen supplies besides the basics. The location is situated on the dry side of the island so the weather was perfect. It is very close to other cities and beaches as well. Our stay was so relaxing and the amenities on the property were top-notch. Thanks Joan and Paul for all the extra time spent to make our stay easy. Just bring your swimsuits and summer clothing and you are ready to go. LARGE PARTY CHARGE: Extra $15 per person per night for guest numbers more than 4. Reservation dates that span the seasonal cutoff dates are fine. Just contact owners by email for quote. Rates are subject to change until reservation is confirmed. Stays of more than 14 nights may be eligible for discount.